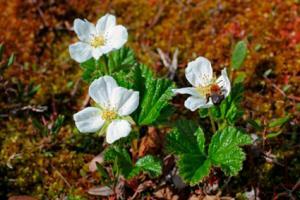 Cloudberry (Rubus chamaemorus) is also called bakeapple. It is a rhizomoutous herb. This plant can be found in alpine and artic tundra and boreal forests around the world. Cloudberry leaves grow on straight branchless stocks and have five to seven lobes that look like hands on them. It has white or white with reddish tipped flowers from June to August. It has male and female plants and requires at least one of each to pollinate the flowers and produce fruit. After pollination, these form raspberry sized berries that are initially pale red but ripen to an amber color in early autumn. It is a creeping plant, growing only 10 to 25 centimeters high. Cloudberries, like raspberries or blackberries, are grown for their amber fruit, which is edible. It can be eaten straight from the plant or baked with similar to raspberries or blackberries. It is used to make jams, juices, tarts, and liquors. 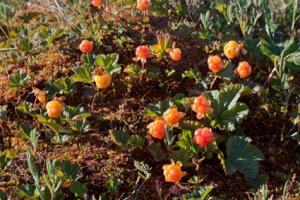 Cloudberries are not grown for ornamental reasons and do not grow high enough to form hedges. Cloudberries attract birds and bumblebees. Birds eat the berries and bumblebees fertilize the flowers. 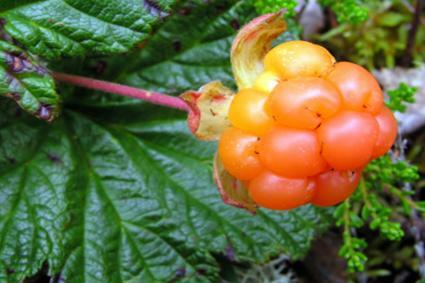 Cloudberries are essentially a wild plant. They grow in Alaska, Maine, Minnesota, New York, and New Hampshire in the United States. They grow across North America in Canada. They grow wild on sphagnum peat moss bogs and like acidic soil (3.5 to 4.5 pH). Cloudberries require full sun to grow. All the current cloudberry berries sold in the world are hand picked from wild plants. Obtain Norway cultivars - Norway has developed two female and two male cultivars for the market. Beginning in 2002, these cultivars have been available to farmers in Norway. Purdue University has a useful information sheet on this. Obtain plants elsewhere - At present the only way to obtain cloudberry plants elsewhere is to dig up wild ones or take cuttings of the rhizomes from them. Cuttings of the rhizomes may be taken in May or August and planted in a sunny, acidic spot. Because they require such an acidic soil, planting them in a half whiskey barrel in sphagnum peat moss is most successful. They will root there and produce a plant. This plant must be kept moist but not soggy to live. As mentioned above, to have berries, there must be at least one male and one female plant in the area. Cloudberry plants are generally wild, so need very little maintenance. They will produce more berries if fertilized with a general 10-10-10 fertilizer in the spring. They should be watered regularly to keep them moist but not soggy. When the plants become rootbound in the pot, they should be divided and replanted in additional pots. Keep in mind one male plant per approximately five female plants is required to keep them producing berries. No pest or disease problems are reported. Cloudberries are harvested in late August and early September when the berries become amber. They are picked by hand just as blackberries are. Because cloudberry plants are relatively rare, the fruit is difficult to find in stores or farmer's markets. The demand far exceeds the supply. To propagate cloudberry plants, you have a choice of handpicking your own fruit, or digging up your own rhizome. You may find seeds for sale on eBay, but they are of dubious quality, so be cautious before attempting to purchase them online. The demand for cloudberries far outstrips the supply. Norway imports tonnes of berries from Finland to meet its needs. While Norway has started cultivating cloudberries, they are still very difficult to come by in North America. Purdue University lists Gartnerhallen Plant Propagation Station Ervik, 9400 Harstad, Norway, as a commercial plant source, but there is no information available on whether they sell to North American homeowners.